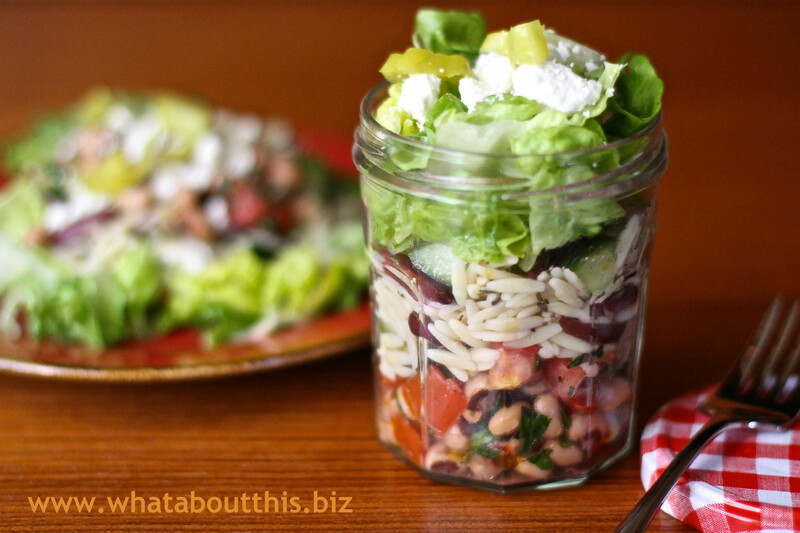 Greek Salad With Orzo and Black-Eyed Peas | What about this? Better together? Sometimes marriages work and sometimes they don’t. But magic occurs when two entities come together and bring out the best in each other. That is exactly what happens in the case of this Greek Salad. In actuality it is composed of two distinct salads, each possessing the substance and flavors to stand alone. The orzo component is light and refreshing with hints of lemon and oregano. By comparison, the black-eyed peas component brings in a certain earthiness with its flavors of tomatoes and parsley. Combining all components together creates a more interesting flavor-complex. This marriage definitely works. 1. Cook orzo according to package instructions. Drain in a sieve and rinse under cold water until cool. Drain well. 2. Toss black-eyed peas, tomato, and parsley with vinegar, 1 tablespoon oil, 1/2 teaspoon salt, and 1/4 teaspoon pepper. Marinate, stirring occasionally, 15 minutes. 3. Meanwhile, toss together orzo, remaining tablespoon oil, cucumber, olives, onion, lemon zest and juice, oregano, 1/2 teaspoon salt, and 1/4 teaspoon pepper in a large bowl. 4. Divide black-eyed pea mixture (with juices) among jars and layer orzo salad, romaine, and feta on top. Add 1 or 2 peperoncini to each jar. Cooks’ note: Assembled jars can be chilled up to 6 hours. Serve at room temperature. 1. I only had Meyer lemons on hand and the results were wonderful. 2. I chopped a few small springs of basil from my garden and added it to the orzo mixture. I loved the added flavor it brought to the salad. 3. If you don’t want to serve the salad in jars, try layering the components in a clear glass salad bowl. 4. For a vegan version, leave off the feta cheese. love the idea of putting your salad in a jar. Perfect for on the go! Thanks Jenn for visiting What About This! My husband loves grabbing a jar of salad from the refrigerator and throwing it into his lunch bag – so easy and healthy!